Grant Forrest started 2017 by wading into the Firth of Forth as he took part in the New Year’s Day “Loony Dook” in North Berwick for the first time. Now the 23-year-old is aiming to be a splash hit in his rookie season in the professional golf ranks. Forrest has enjoyed a much-needed break since getting his new career off to a great start by finishing just outside the top 40 in the Dunhill Links Championship in October then securing a Challenge Tour card for this season. He’s now in Arizona preparing for the new campaign and will certainly be finding it warmer there than he did when joining some other hardy souls by taking that plunge into the freezing Forth in his hometown at the beginning of the month. “I’d never done it before,” said Forrest, laughing. “We were out for New Year and a few folk asked if I was doing it. So I fired along. The water wasn’t too bad. I could cope with that. It was coming out the water that was hard as it felt freezing. While the schedule hasn’t yet been released, the first Challenge Tour event of the season won’t be until mid-March and it will probably be May before the second-tier circuit really swings into action. Forrest had toyed with the idea of trying to qualify for the Asian Tour to give himself some playing opportunities in the meantime, but he believes his trip to Arizona can serve a better purpose after doing some fine-tuning with his coach, Craigielaw PGA pro Jonathan Porteous. “One of the guys on my college team at the University of San Diego, Will Twitty, lives there,” said Forrest, who made the switch to the paid ranks on the back of a glittering amateur career, which included three national title triumphs. “He’s a pro, as is his dad Howard (a three-time PGA Tour winner), so I’m going to stay with them to practise for a few weeks. A couple of other old team-mates also live in the Scottsdale area, so it will be good to catch up with them as well. “We are going to try and qualify for the Farmers Insurance Open (a PGA Tour event at Torrey Pines, where Tiger Woods is set to resume his comeback at the end of the month). I’ve entered into the pre-qualifier for the Monday qualifier. It is something to play in and, if I am lucky to get through, it will be great to play in a PGA Tour event. “While I can’t wait to get going again, I’m not going to lie because it’s been great to have some chill out time since Tour School and re-charge the batteries. It’s been full on really since I went through college and then played a full amateur schedule. “It’s been a lot of golf so it is nice to get a proper off-season. My body was ready for a break but more so mentally, I’d say. “I had a good taste for what lies ahead by playing in a few pro events last year. Now that I’ve turned pro and have a plan set out, it is exciting as I wait for it to kick off. 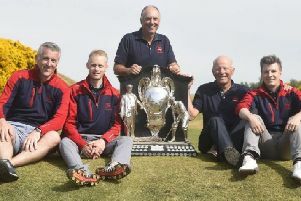 As he attempts to do that, the former Scottish Amateur champion is delighted that he’ll be wearing the same clothing brand as the likes of world No 5 Jordan Spieth and rising European Tour star Matt Fitzpatrick. In a double announcement just before Christmas, Forrest’s management company, Edinburgh-based Bounce Sport, secured an apparel deal with Under Armour, who also kit out tennis world No.1 Andy Murray, and a club contract with Titleist. “It is really good to have deals with Titleist and Under Armour,” he admitted. “Titleist have supported me since I was 16 and it is great to continue with them as they are a great company.